A series of visualizations of the tsunami generated by the 1906 earthquake. 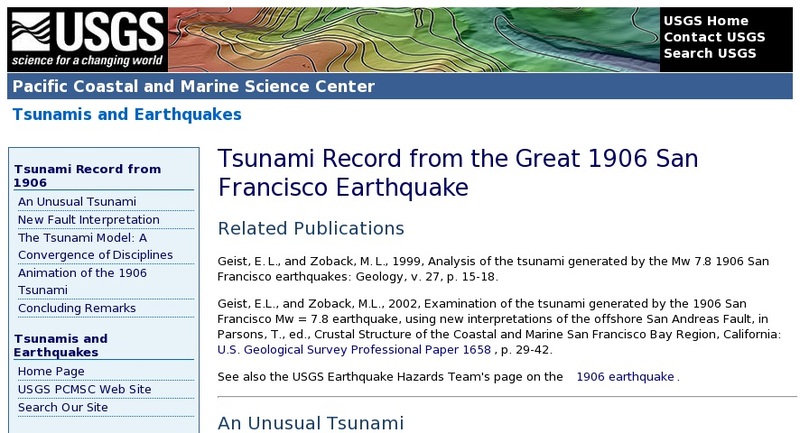 Included are maps of the San Andreas fault offshore, in San Francisco Bay, diagrams of the magnitude of the slip under the San Francisco Bay, and animations of wave height following the earthqake. Two separate animations are featured as QuickTime movies; one is centered on the Golden Gate Bridge, the other shows the whole San Francisco Bay.